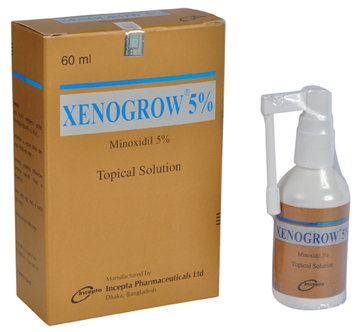 XENOGROW 5%: Each mL solution contains Minoxidil USP 50 mg. Minoxidil can reverse the hair loss process of androgenetic alopecia by the following means: increase the diameter of hair shaft; stimulate anagen growth; prolong the anagen phase; stimulate anagen recovery from telogen phase. As a peripheral vasodilator Minoxidil enhances microcirculation of hair follicles. The Vascular Endothelial growth factor (VEGF) is stimulated by Minoxidil and VEGF is presumably responsible for the increased capillary fenestration, indicative of a metabolic activity observed during the anagen phase. 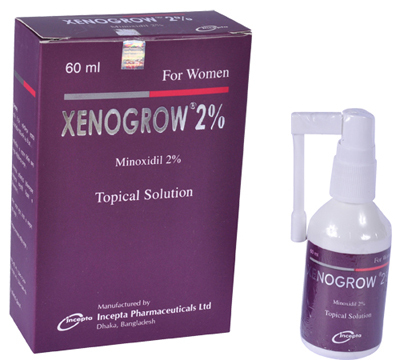 Minoxidil indicated for the treatment of alopecia androgenetica in men and women aged between 18 and 65. Hair and scalp should be thoroughly dry prior to topical application of Minoxidil. A dose of 1 ml Minoxidil cutaneous solution should be applied to the total affected areas of the scalp twice daily. The total dosage should not exceed 2 ml. If fingertips are used to facilitate drug application, hands should be washed afterwards. It should be used twice daily for four months or more before evidence of hair growth can be expected. Minoxidil is well tolerated. However few side effects such as hypertrichosis (unwanted non-scalp hair including facial hair growth in women), local erythema, itching, dry skin/scalp flaking, and exacerbation of hair loss have been reported commonly. Before using Minoxidil, the user should determine that the scalp is normal and healthy. Patients with known cardiovascular disease or cardiac arrhythmia should contact a physician before using Minoxidil. Minoxidil contains alcohol, which will cause burning and irritation of the eye. In the event of accidental contact with sensitive surfaces (eye, abraded skin and mucous membranes) the area should be bathed with large amount of cool tap water. Pregnancy: Studies in animals have shown reproductive toxicity. The potential risk for humans is unknown. Minoxidil should not be used during pregnancy. Lactation: It is recommended that breast-feeding should be discontinued during treatment with Minoxidil.